Follow the page link above in menu bar for details! 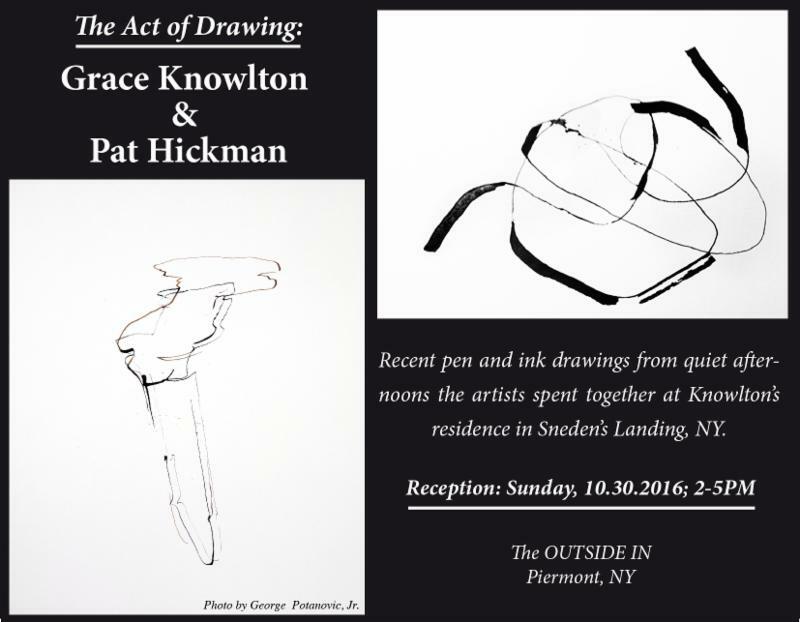 THE ACT OF DRAWING: GRACE KNOWLTON AND PAT HICKMAN OPENS 10/30/2016; 2-5PM AT THE OUTSIDE IN, PIERMONT NY. The Act of Drawing: Grace Knowlton and Pat Hickman. Recent pen and ink drawings from quiet afternoons the artists spent together at Knowlton’s residence in Sneden’s Landing, NY. Hickman is an admirer of Knowlton’s, “How to Draw Wrong”. Their results emphasize the physical act of drawing itself as an essential aspect of a finished work. Reception 10/30/2016; 2-5PM at The OUTSIDE IN, Piermont NY. TURNED WOOD: JIM DECRESCENZO OPENS 10/30/2016; 2-5PM AT THE OUTSIDE IN, PIERMONT NY. Turned Wood: Jim DeCrescenzo. Handcrafted stools, pedestals and bowls honoring his legacy will be sold from the family estate to benefit his daughter Paula DeCrescenzo. Including several unique wooden stools, tables and pedestals designed by Chris Lehrecke and turned for Ralph Pucci International, NYC. Reception 10/30/2016; 2-5PM, at The OUTSIDE IN, Piermont NY. The late Jim DeCrescenzo was a lifetime resident of the Hudson Valley who turned many of his pieces from his studio in Saugerties, NY, until his early death in September of 2014. DeCrescenzo’s master craftsmanship brought him to the attention of designer Chris Lehrecke of Hudson, NY and DeCrescenzo turned studio art stools, side tables and pedestals from Lehrecke’s designs for many years for Ralph Pucci International, NYC. His turned wood pieces can be found in many national and international private and public collections including prominent NYC restaurants and hotels. Sundays, January 8 thru April 9; 11-3. Dates have been set for the 2017 season and we are planning to make this the best “SOUK” ever with the addition of sponsorship and volunteering opportunities. Email thesoukonsparkillcreek@gmail.com or call us on 845-398-0706 if you have any questions or just wanna say hi. BIRDMAN, a fanciful hybrid of new paintings from Eleanor Grace Miller that engage in senseless behaviors and contradictory impulse control. Strangely captivating and presented in brilliant, vibrant color, the forms in the BIRDMAN series evolve and re-shape themselves… they perform rituals, confront, wander and lurk. Reception Sunday May, 22nd; 3-5P @ The OUTSIDE IN, Piermont NY. Miller uses BIRDMAN to illustrate a fusion of human and bird forms that has existed in nearly every culture dating back to the Lascaux caves. These images are found in painting and sculpture, notably in totems and ceremonial masks. Perhaps the most animated figure being the hazmat suits worn by the 14th century Plague physicians (below) that characterized the chaos and instability of the period. A classically trained artist, Eleanor Grace Miller received her BA from Monmouth University, where she studied under Eleanore Mikus, a vanguard Minimalist, and Bernard Aptekar, one of the original SOHO Ten Downtown, and continued her studies at the National Academy School of Fine Arts. Miller has exhibited extensively throughout the East Coast, both in fine art galleries and corporate venues, and is the recipient of numerous awards, including Best of Show at the Museum of Fine Arts, Springfield, MA, the Anna Hyatt Huntington Award from the National Arts Club, and the Gamblin Artists Award from the Salmagundi Club. Her work is in both private and corporate collections. She is currently on the faculty at RoCA and the Pelham Art Center. Visit http://theoutside.in/thesouk/“The SOUK” site for details. Visit The SOUK website for vendor list and weekly offerings. SUNDAYS, January 10th-March 20th, 2016; 11 AM to 3 PM. An indoor epicurean upmarket from farm fare to fresh baked, traditional to exotic, and savory to indulgent, served in the lively communal tradition of the ancient markets curated to transport you into the throes of delight. Come escape the winter’s cold into a rich sensual oasis perfumed with spices, rich oils and artisan cheeses mingling into the smoky air with the irresistible aromatic mixtures from cauldrons of steamy simmering soups, roasted meats and fresh baked pies prepared to eat here or to take away. Spend your lazy Sundays meandering a shifting, diverse labyrinth of weekly changing vendors through an exotic “open” air green house market space or choose to rest in conversation near the wood-stove’s burning fires with something warm, surrounded by the finest art and craft in the Hudson Valley. Happy Holidays to You & Yours! Come visit us for gifts you cannot find anywhere else! Shop Small, Shop Local & give back even more to your community with locally sourced handmade gifts @ OUTSIDE IN! Join us this weekend in support of independent businesses across America. We have a great functional pottery sale and are offering a 20% discount ALL WEEKEND on non-sale items for purchases over $100, extending the cash back reward offered by AmEx in promotion of Small Business Saturday (SBS). SBS encourages people with monetary rewards to shop at the small businesses that help write the story of America. Developed by American Express to inspire customers to shop local & Shop Small, SBS has become one of the busiest days of the year for small businesses. This is the perfect opportunity to shop early for something truly unique for the holidays this year. Thanks to our wonderful stable of artisans for making this happen and to our loyal customers that have supported our mission to make one of a kind locally sourced products available for the growth of our community. Uncommon ARTefacts for the Inside & Out.